Creatively Me – A crafty life…. I know it’s been awhile. I finally started a new job, full time and so my crafting time has been cut back quite a bit. I’m trying to figure out a balance between work and play so my posts may be a bit lacking coming up for a bit. I do apologize for that. However, I do have a challenge for Pile It On this week. Our theme is Lots of Layers, which is something right up my alley. I really like this fun window card…it uses a couple of different punches and stamps from Stampin Up and I made it in a class! The top layer is cut out with a scalloped rectangle, the next layer with a heart and the back layer has the stamped popped up on top of a layer of trees which is on a layer of patterned paper! Be sure to stop by the PIO blog and see the wonderful creations the rest of the DT has made for you! Happy St. Patrick’s Day! Woohoo..I love this day because green is my fave color and it’s a day dedicated to the green! Ok, down to business….Pile It On’s new challenge is here… Our theme is favorite color/rainbow. I’m using an image from The Paper Shelter who is this month’s sponsor. Of course I had to do a green background to honor the day. I had some fun and used my Sizzix die to make a circle scalloped card this time around. I also cut out a piece of the Lawn Fawn Rainbow paper and then circle cut the image (which was pre colored…) I just added some wink of Stella to make it shine a little more. The Hello sentiment was die cut from a set of Recollections dies. A simple card but a cute one I think. Now time to head over to the PIO blog and play along with us this week! Hey everyone! 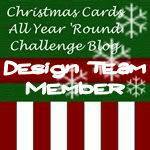 I’m up with this week’s challenge at the Cardz4Guyz blog today. My theme is to use a die cut on your project..pretty easy right! For my card, I used this really fun fold that came into my email from Debbie Naylor who has a great Stampin Up blog www.UnfrogettableStamping.com . She sent us this great tutorial on how to make a U-Fold card! I really thought this was fun so I gave it a try ! I used some Stampin Up with this card but you can totally use whatever product you have in your stash! Now I’m just showing you the front of my card, but if you check out her original tutorial from Feb 14, 2019 you will see just how fun this fold is! This is super easy thanks to her step by step instructions! Try it, you will be making tonz of these! Now for my card, I used some scrap paper and an old stamp that I had for the sentiment. I used a combination of my CC Designs die to cut out the oval in the centre and my Stampin Up feather stamp & die set for the focus. I really love how this turned out and I if you get a chance, check out Debbie’s website for some great inspiration and tutorials. She has a place where you can sign up for her newsletters, tutorials etc. I just used some random papers from my stash for this and a couple of different dies for the image and mat…I added some St. Patrick’s day ribbon and shamrock stickers. The sentiment I printed out on my computer in a Celtic font which I thought went really great with this image! Come on over to the PIO blog and see what the rest of the DT has created for you! Welcome to March everyone. I know lots of people say that February went by fast, but not for me! Oh man, it felt like those Arctic cold days just kept dragging on one after the other. Ok…new challenge at Christmas Crafts All Year Long…this month’s theme is Mistletoe/Love/Kissing….so go ahead and create a Christmas project with that theme in mind and we want to see it! My stamp set is actually a Valentine’s day one from Recollections. I embossed it in black and then colored it in with my copics. Surprisingly, I had zero items for mistletoe!!! I did manage to find a little cut apart from a sheet that happened to have a mistletoe on it, so I fussy cut it out and put it atop of my ‘hogs. The DP is Merry and Bright from Pink Paislee and the stamp set is from Momenta (wow..old on that one eh??? ). Hop on over to the blog and play along with us! So I am a bit late in posting this week, but I wanted to remind you that you still have a few days left to enter our challenge over at Use Your Stuff and the one that we are partnering with on the Double Trouble Challenges site! Once you link up to ours, be sure to check theirs out as well so you can win a fun prize! Our theme at Use Your Stuff is Magic! I created this layout from our magical trip to Disneyland/San Diego a couple of years ago. It was the first time that our son had gone to Disney and he just loved it so much. I took a lot of selfies during the trip and when I had done this one in front of San Diego Zoo two cute faces poked out on either side of me! I am still working on the Disney album so this is another fun page to pop in there. To incorporate the challenge from Double Trouble (they have a fun tic tac toe board) I went with the die/punch, vellum and the ribbon. Can’t wait to see what magic you make and be sure to link up with Double Trouble too! It’s a bit early but I have a St. Patrick’s Day card for you. It’s for our Clean and Simple Challenge over at Cardz4Guyz for you! I decided to break out my Tim Holtz Crazy Birds stamps and dies along with their little accessories. I haven’t used this set in practically forever! I colored him with my copics and then cut him out using the co-ordinating dies. I did a squiggly, hand drawn border and then for embellishments, just a titch of washi, a shamrock and some enamel dots. The sentiment is from Hero Arts. Come play along with us on the blog and show us your CAS!